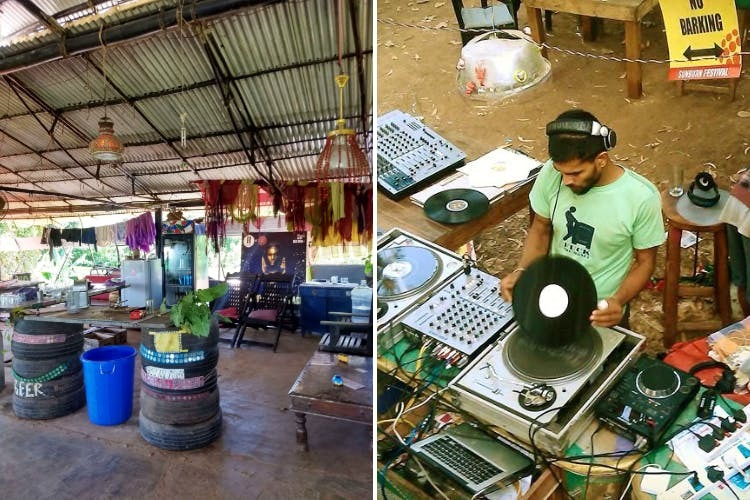 Cirrus At Anjuna is a free-for-all arts and music space that’s as abstract as it gets. Ignatius (aka DJ Iggy) manages to combine activities with a residential format that’s pretty chill. You’ll find tree houses, a skate park, a pool, a terrace café, a vinyl ambulance, upcycled cottages and events that span across shopping and underground music gigs and arts meets. You could follow the cues on Cirrus’ FB page and find yourself at a live jam or a late-night party, you can possibly call and check if their café is open and have a meal that’s cooked keeping in mind your blood group and health concerns or be a part of their weekend garage sale. If you get too tired, you could choose to sleep on a hammock for INR 200 a night. You can, on an informal note, help Igantius fix how the tree house looks or finish the Vinyl Ambulance (for the record, it’s been quite a star at flea markets and music fests like Sunburn) that he drives around. In return for your assistance, you can seek his inputs on how you could modify your diet and boost your well-being (his advice on nutrition and workouts is really something). Or, you could be an artist just looking at a safe place to write, make art or spin some tunes (there are consoles by the beach, in the café and in the van)? In which case, Cirrus is full of creative inspiration. And, Ignatius and his family will welcome you as long as you’re mindful of everyone’s personal space here. Sounds like a lot? Well, it is a lot. The possibilities of what you can do at this self-sustaining community (they have beds and cottages and a village dorm they made from discarded everything) or how you can collaborate with fellow Cirrus dwellers is endless. P.S. Promise to respect the rules of this freewheeling, part hippie, mad creative community space, and you’ll be good. The entry to this mysterious place isn’t the most obvious. Just follow Google Maps and walk through a gate made from recycled bottles.